If there's one part of my body that I am extremely self conscious about then it's my double chin. As i'm getting older, it's getting worse. I used to only have one when I pushed my chin back but now I have one permanently that's not only visible from the side but the front of my face too. I hate it. It's the first thing I notice in photos. I'm like a yoyo when it comes to my weight but it seems even when i'm in my best shape, my saggy chin is still present. 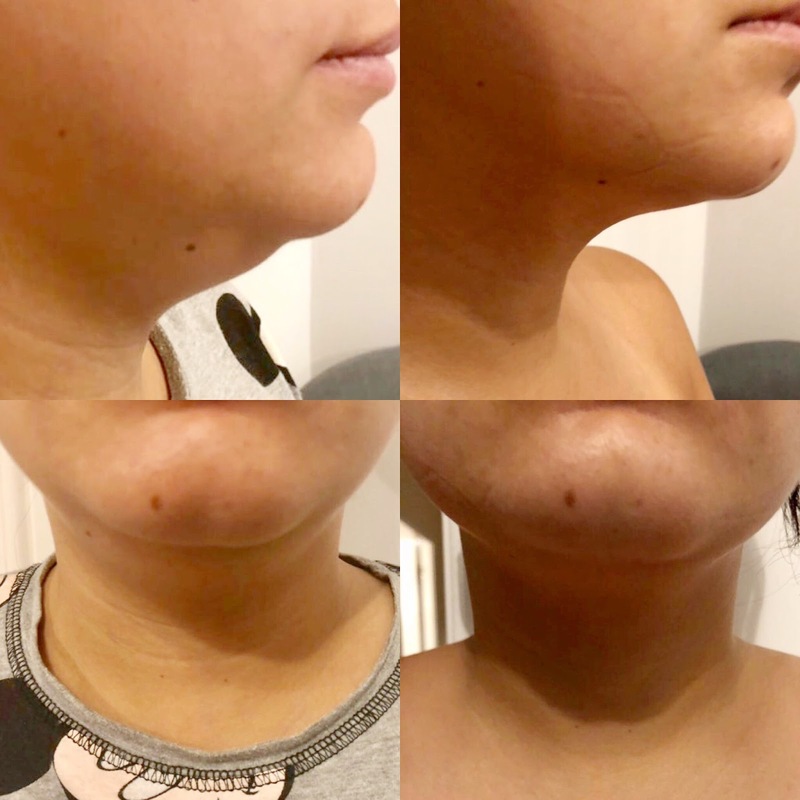 I was asked if I would like to try out the Chin Up Mask which is a non surgical way of reducing the appearance of a double chin. As you can imagine I jumped at the chance. 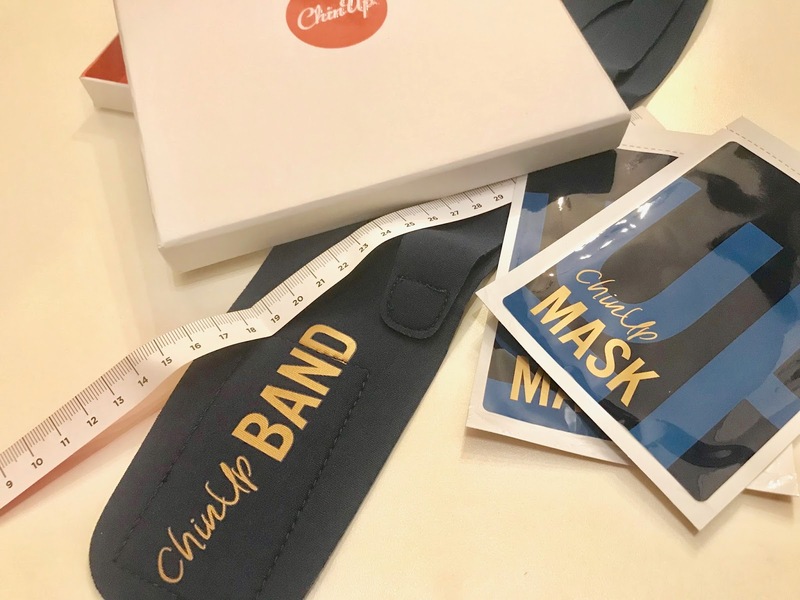 I received a trial pack which contains everything you need for two treatments which is a tape measure, a band and 2 masks. 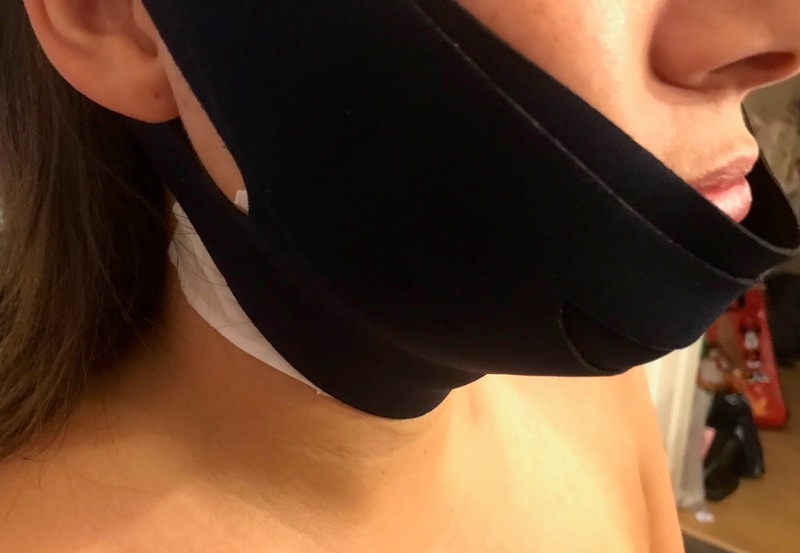 The Chin Up Mask is designed to visibly improve the appearance of a double chin by up to 2cm in 30 minutes. It provides instant results by facilitating fat release and aids in the contouring process. It has a special Skintronics serum which helps to convert fat into stabilised fibrous tissue. It boosts the density of collagen and therefore increases cell tension to provide a lifting and firming effect. The mask also contains natural extracts from Acacia, Mint, Aloe, Grape, Olive, Apple and Citrus Fruits. I couldn't wait to try it. The first thing you have to do is measure your chin from ear to ear. You measure across the front and underneath. I was 28cm around the front and 25 underneath. 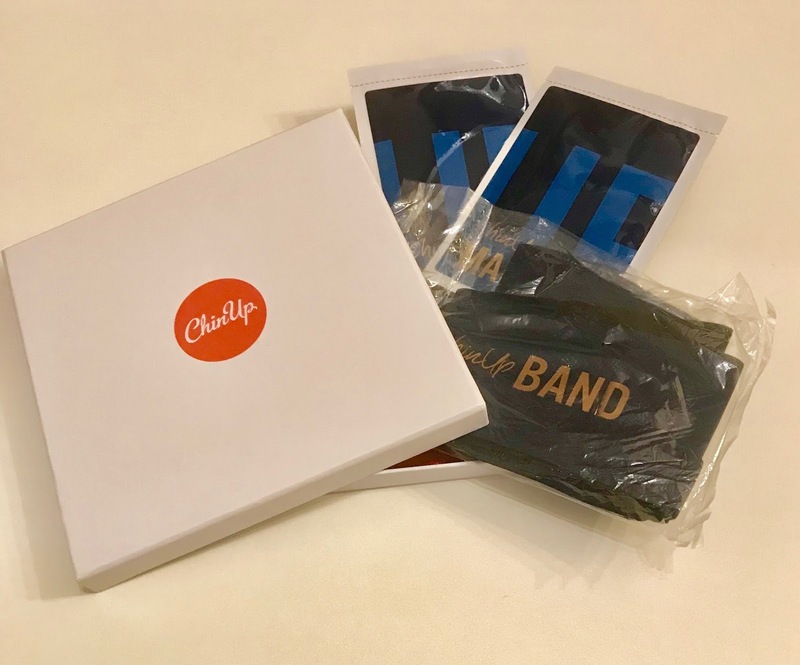 I think this is a great idea as this allows you to actually measure the results afterwards rather than just seeing a visual difference, so you know whether it has worked or not. Next you apply the mask to your chin. Your skin needs to be clean and dry and without make up. Then, you wrap the belt around your neck and head and secure tightly. I must admit I found putting the belt on quite difficult so I asked hubby to help. I had it on the wrong way around to start with, but that's probably just from my dopiness and not reading the instructions properly. Once I had the belt in place my chin and neck started to feel very warm and tingly. I was quite alarmed at first but this is a sign that the mask is working. 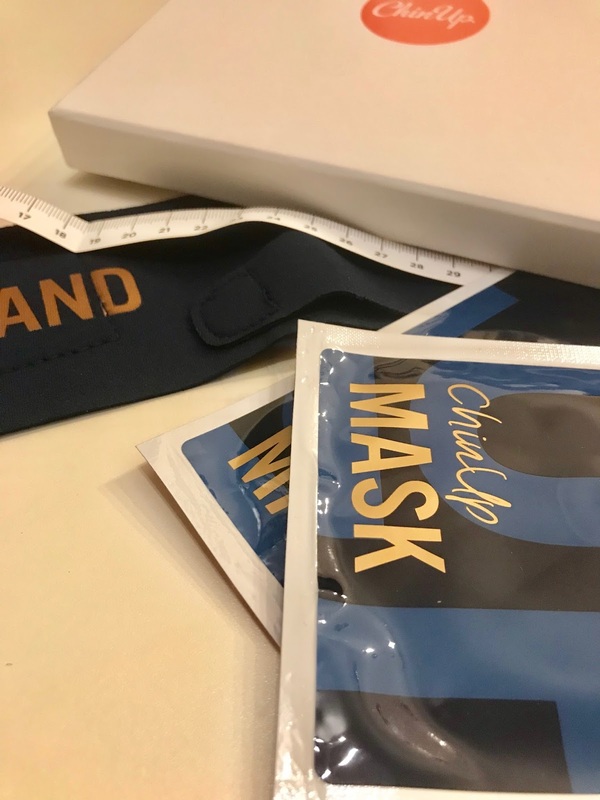 For a few minutes I wasn't sure whether i'd be able to wear the mask for the full length of the time as I felt like my neck was burning a lot but it eased down and I got used to the sensation. I was worried that I may have some redness or irritation when I removed everything because I have super sensitive skin but my skin looked absolutely fine. Instead of measuring the difference first, I decided to check the results in the mirror. I could instantly see a difference especially from front on. My skin certainly looked lifted and more youthful. I couldn't wait to see what the cm loss was. Around my chin went from 28cm to 27.5cm and underneath went from 25 to under 24. Even though there's not a massive change in the actual results, i'm sure you can agree that there's a huge difference in my photos. My before photos make me look like I have a Turkey neck (so embarrassing). The difference from the side is amazing. Overall, i've been massively impressed with the Chin Up Mask. I was so skeptical about using it but i'm amazed at the results. They last for a few days on me so I would have to keep using it once a week i'd say to keep up the full effect. The trial set is currently on sale at £13.98 instead of £34.94 (price correct at time of publishing this post). You can then buy refills for future use. I don't think I could afford to use this regularly but I certainly will be using it for holiday's, night's out and special occasions. I think you are being unfair, you are beautiful. But I’m actually very shocked to see that it works! Might give it a try.